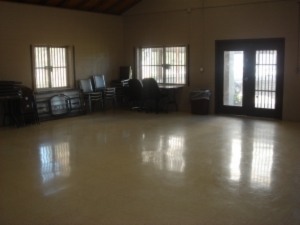 All fees for rentals must be paid in advance with cash, check, or money order only. We do not accept temporary checks or credit cards. 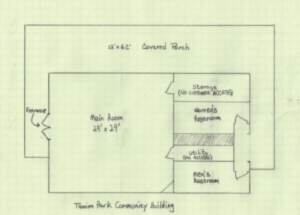 We are unable to accept cash for the Tamina Park Community Building. it is strongly recommended to visit our precinct office in New Caney to complete your reservation. Please note : If mailing your rental agreement and fees to our mailing address of PO Box 84, New Caney, TX 77357, there is a chance that your reservation may not be fulfilled due to a separate reservation made and confirmed while your request was in transit. The calendar above will be updated daily, but may NOT reflect availability in real time. Reservations are on a first-come, first served basis and will be booked and guaranteed on the calendar only after deposit and rental fee are received and receipts are issued. Cancellations must be made two full weeks prior to the scheduled rental date or your deposit will be forfeited, leaving only rental fees to be refunded via check issued by Montgomery County. Original receipt is required for all refunds. A fee of $30.00 will be charged for any check returned to us by our bank for any reason. No alcoholic beverages allowed in this facility or on the premises. 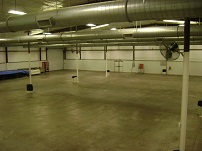 Availability will be limited to 8 hours total only – including set up and clean up. 1:00 PM until 9:00 PM on Sundays. 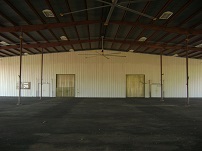 All fees for rentals must be paid with cash, check or money order only. We do not accept credit cards or temporary or post-dated checks. All fees MUST be paid in full to make a reservation. 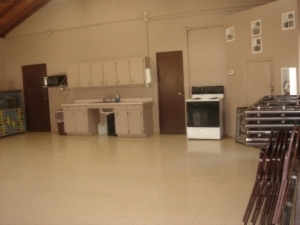 Amenities : Kitchen facility including, Stovetop/Oven, Refrigerator, Microwave. 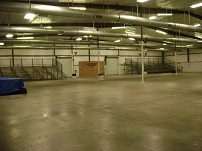 Gym Main Room measures 100′ X 65′ and includes approximately 250 Chairs, 34 Round 6′ Tables and 33 Rectangular 6′ Tables. Please note: Printing a rental agreement does NOT complete or guarantee a reservation date. Reservations are on a first-come, first served basis and will be booked and guaranteed on the calendar only after deposit and rental fee are received and receipts are issued. Weddings or Quinceañeras are NOT allowed at this facility. VIOLATORS WILL LOSE THEIR DEPOSIT AND COULD BE PROSECUTED – NO EXCEPTIONS. All fees must be paid in full to make a reservation and must be paid with cash, check or money order only. We do not accept credit cards or temporary or post-dated checks.. Please note: If mailing your rental agreement and fees to our mailing address of PO Box 84, New Caney, TX 77357, there is a chance that your reservation may not be fulfilled due to a separate reservation made and confirmed while your request was in transit. unless other events are scheduled. We encourage you to call our office first. 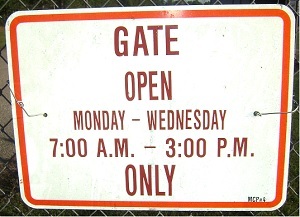 Please enter and unload horses through back gate on McCleskey Road. 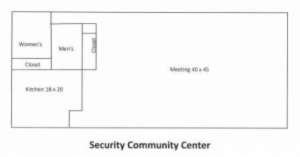 Alcoholic beverages are allowed in this facility, however security is REQUIRED at renter’s expense and MUST be scheduled through Sgt. Ricky Warwick at 281-577-8985. In some cases, additional days (for the day before or after reservation) can be offered at a discounted rate. Reservations are on a first-come, first served basis and will be booked and guaranteed on the calendar only after deposit and rental fee are received and receipts are issued. Cancellations must be made two full weeks prior to the scheduled rental date or your deposit will be forfeited, leaving only rental fees to be refunded via check issued by Montgomery County. or call Shirley Grimes at 281-682-6402. 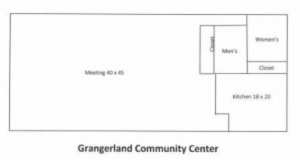 Park amenities are not included in rental of the Community Building. You may use the park, but are not given exclusive use because the park itself is open to the public and is first come, first served. approximately 75 people (without tables). 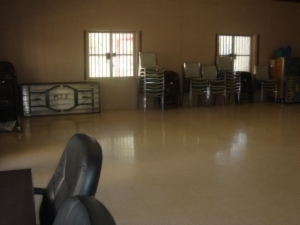 Main Room includes 23 six foot tables, 56 folding metal chairs, and 44 padded chairs. It is necessary to set an appointment to complete your reservation. Call Shirley Grimes at 281-682-6402 to schedule your appointment. Please note : Informational calls should be made between 8:00 AM until 5:00 PM. 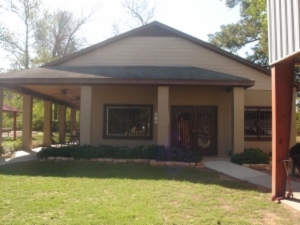 Shirley Grimes’ office is located at 18955 Main Street, Conroe, TX 77385. We do not accept credit cards or temporary or post-dated checks. All fees must be paid in full to make a reservation and must be paid in advance with cash, check, or money order only. We do not accept temporary checks or credit cards. 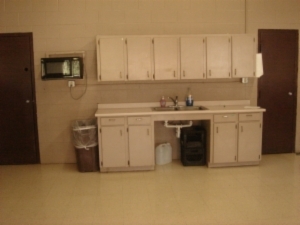 Amenities: Kitchen Facility including Ice Machine, Stove, Refrigerator; Microwave. 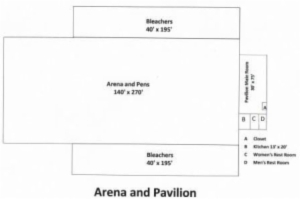 Show Barn includes approximately 25 eight foot plastic folding tables, 250 metal folding chairs, and 2 large mobile bleachers (If additional tables and/or chairs are needed, renter is responsible for bringing). 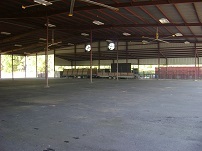 18,900 square feet enclosed and climate controlled with additional 22,000 square feet covered (but not enclosed) in rear where built-in show pens are located.